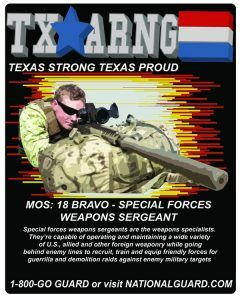 The Texas Military Forces is composed of the three branches of the military in the state of Texas. These branches are the Texas Army National Guard, the Texas Air National Guard, and the Texas State Guard. All three branches are administered by the state Adjutant General, an appointee of the Governor of Texas, and fall under the command of the Governor.